In recent years, language has been used as evidence in assessing asylum seekers' claims. Do they come from the country that they claim to originate from? Although this would seem quite simple, reliable assessments are hard to achieve - many factors intervene: high variability, multilingualism, extended stays in refugee camps, the lack of systematic knowledge about the languages, and mixed ancestry. European countries have developed various techniques, but experts often disagree about these and the validity of the results. 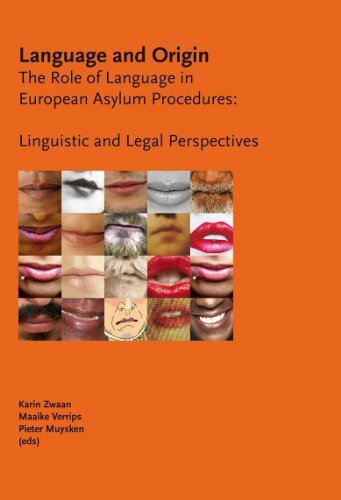 This book contains a series of papers presented at the ESF Exploratory Workshop Language and Origin: the role of language in European asylum procedures. The workshop took place at the Netherlands Institute for Advanced Studies (NIAS) in Wassenaar, April 22-23, 2010. It brought together an interdisciplinary group of experts from different European countries in a constructive setting, to explore the different techniques, exchange views, learn to speak each other's language, and to set priorities for future research and developments. If you have any questions about this product by Wolf Legal Publishers, contact us by completing and submitting the form below. If you are looking for a specif part number, please include it with your message.